I reaaaaally don't care if it's Raspbian or Debian screwing up the startup of nfs-kernel-server, it should have been fixed long ago. And there are endless posts on debian raspbian and other forums about this, many with fixes that only work in very specific (unstated) circumstances. stuck a new line in crontab to postfix the mess. I am using an old Vixen GP mount with the Vixen MT1 stepper motors. I am using a raspberry pi with Pololu stepper drivers. I've described this in an earlier post. Now comes the job of making this work - initially for guiding and hopefully later for 'goto' as well (albeit that will be a bit slow with these motors). do a quick hack to enable Gordon'd autogider software to talk to my driver software. I have done a quick video of the test program running the code to slew the scope as fast as the steppers can go here. Some very simple ways to do this use cgi, but I soon found this method awkward to use as well as looking like there were significant performance overheads. I switched to http.server.HTTPServer which I like and provides a 'shape' of framework I am comfortable with. On a LAN connected raspberry pi 3 this approach will happily serve up to 200 requests per second - as long as the overall network bandwidth doesn't get too high. I wanted to minimise the load on the Raspberry Pi and keep the user interface simple to use and responsive. To do this the python web server is very simple and - after serving up the initial page - just responds to requests from the client. 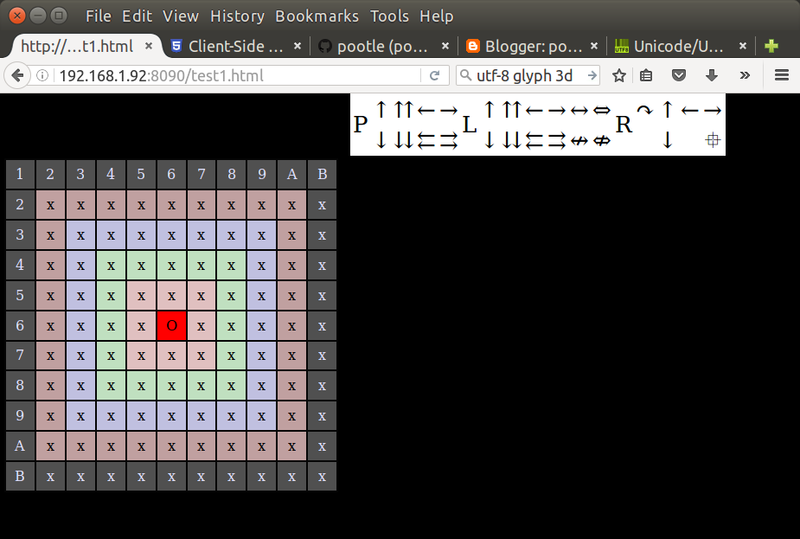 The web server runs happily on Raspberry Pi (including zero) and on my ubuntu laptop. It appears to work well with Firefox, Chrome and Internet Explorer on laptops / PCs. It does not work in Edge, but as I have little interest in Windoze , I'm not really interested in the ie / edge use. It will run on reasonably fast phones / tablets, but not at high framerates; my old Galaxy S2 isn't much use, but a Hudl2 works well as long as the framerate is kept low. This is just a proof of concept, so presentation and error handling are minimal / non-existent, and functionality is limited. I've used 2 splitters for this. One specifically sold to power Raspberry Pi, the other a more generic one, but it is cheaper and more flexible (it can output at 5V, 9V or 12V - obviously for direct power to a pi, it is on the 5V setting. The switch in front is a Cisco SG200 08P, which is expensive, but provides close control and reporting on what is going on with each port. Much cheaper PoE switches (like the Netgear prosafe range) are available (but typically don't have the reporting I used here). The ASIX AX88179 is the main part of a USB3 to Gigabit ethernet adapter. The Pi can drive significantly more than 100Mb with a Gigabit adapter (even although it is USB2). all the Gigabit USB adapters seem to be USB3 (quite sensible if you want to get close to full utilisation). Also being Gigabit means that potentially the green ethernet savings should kick in. As a final test I had the Pi Zero running RPi cam control streaming live to a web browser on another PC, and with 2 servos waving the camera about. This took the power up to nearly 5 watts with everything running smoothly - apart from the live camera feed which was just a blur! The TP-Link PoE adapter is the better solution - more flexible, more efficient AND cheaper. The Official Rpi WiFi dongle seems to run at about 1/2 watt when idle. The USB3 to Ethernet adapter I got is VERY inefficient - about 1 watt doing nothing. You can run a pi very reliably this way - even with the camera and little servos running. Rule 1: your display needs to have at least an 11cm wide viewable area - preferably a bit more. Without this width, significant areas of the image will only be visible to one eye - oh and I might need to adjust the app so it allows the panel to go off the edge of the screen. To help with setup, I prepared a freestanding web page that enables settings to be tweaked, and saves those settings to local storage so they are persistent. 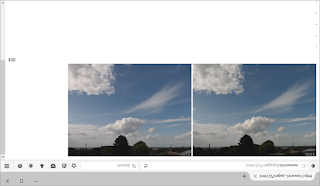 This web page can also be used as the base for display of stereogram images and similar things (like live streaming from stereo webcams), and can be run on devices that don't support the google cardboard app, so you can use google cardboard (the cardboard) without google cardboard (the app) - although not with any google api based apps obviously. web pages and other stuff. Below is the method I use to setup cardboard. The setup also prepares the settings for use in a stereo image viewer web page I am working on - more of that another day! Note if you have a lazy eye or suffer from bouts of double vision or similar eye problems, you probably shouldn't do it this way! First experiences with Google Cardboard were that things looked 3D, but it always felt a bit weird and uncomfortable. Usually the 'not rightness' got worse as I looked further from the centre of the image. To start with, I messed around with profile generator, but soon came to the conclusion I was starting from the wrong place. Could I make it better? because the lens spacing doesn't match my ipd, and the lenses have a fair bit of distortion, there is a small sweet spot and as I looked away from the sweet spot, the 2 views diverge in ways my brain did not like. This makes things feel more and more 'not right' as you move further from the centre. The lenses introduce a lot of pincushion distortion - I suspected that while not ideal, things would look a whole lot better if the spacing is fixed even with this distortion. Of course having fixed item 1, a new profile should make the google app (and others that use the underlying cardboard API) look a whole lot better as well - after generating a new profile. 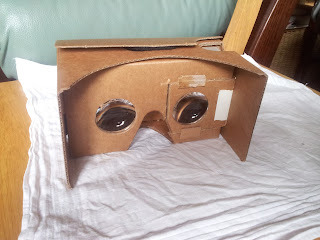 Google cardboard is set up for an ipd of around 64mm, and I measure my eyes at 67mm, but even this small difference seems to have a big effect. fix the ipd to lens mismatch. write an app (web page) that would allow me to view stereo pictures in a web browser. I wondered how minimal I could go for a pi based camera, both in terms of size, power and to a lesser extent cost. I have been using webcams, but I soon found that even on a pi 3, 2 USB webcams wouldn't run reliably at more than very basic resolution under motion. I decided to see how far I could go with a Pi Zero and a pi camera. Of course this means I can only put 1 camera on the Pi, but I gain flexibility in that the cameras are no longer USB cable length limited. I also decided to I to try making the camera steerable using this little adafruit gadget. Total cost about £60 if you have to buy it all. Were the servos and the pan tilt kit going to be stable / accurate enough? Would a single core processor cause glitching or other problems? Was there a reasonable way to route the ribbon cable? meh - ribbon cables are always a pain with 2 axis movement. is it safe to run the 5v servo supply from pin 2? Well on the Zero there is no fuse between the usb power socket and pins 2/4 so assuming your servos are well behaved, then yes. On other recent models the polyfuse has been uprated to 2A, so those should be fine as well. Well I have setup my Adafruit DC and Stepper Motor HAT, and it does drive the stepper motors, but has.... certain limitations! This is all down to the HAT doing everything over I2C, and because the HAT requires a prod for each step (including each individual sub step in micro step mode), this limits the step rate to how fast the commands can be poked down the (not very fast) I2C bus. The max rate is around 75 - 80 commands per second - so with 2 motors to move I can only do around 40 per second. 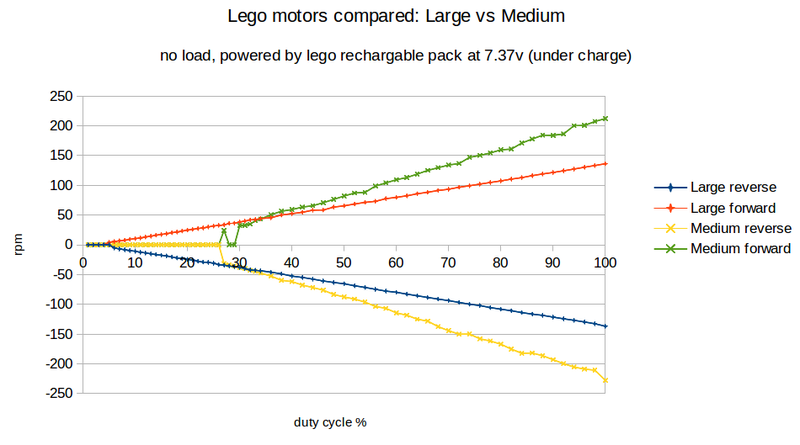 Any attempt to go faster just blocks in the Adafruit library calls to prod the motor. The CPU utilisation though remains low, so that part at least is sensible. However tracking stars and autoguiding should be fine with this rate (sidereal tracking needs just under 10 per second), so I shall carry on with some software and also prepare to go for Pololu A4988, set up to drive the stepping direct from GPIO pins. In the meantime I intend to use lin_guider to track a star and report deviation over UDP, I shall write a program to pick up the deviation and directly drive the steppers through a full PID implementation. I have a PID controller I wrote earlier which I can use for this, the only hiccup at the moment is that the Adafruit software only appears to be available or Python 2 *sigh*. On the few occasions that the weather has co-operated I have been testing tracking with the setup described earlier. It has not worked well. Tracking was very occasionally good, mostly mediocre and sometimes dire. I have though much improved the wifi access by setting up an external access point. The signal is now excellent and remote desktop from inside to the pi on the 'scope works well. I used an outdoor ap with cheapo power over ethernet all stuck onto the house with a cheap aerial mounting kit from B&Q. I wrote a trivial python script to pulse the ST4 interface to see what was happening at the coal face and it was not pretty. At the 1.5x speed setting on the DD-1 controller pulses long enough to cause 3 steps were actually doing from 0 to 3 steps, very few were 3, and quite a lot were 0, this was with the mount indoors and no load. A bit of back pressure against the direction of movement made the situation significantly worse. Increasing the speed setting to 2x helped quite a bit, but any significant load still saw the difference between intended steps and actual steps increase dramatically. I could hear the pulses on the motor, but they were not causing the motor to actually step. buy an EQ5 goto upgrade kit - these fit the old Vixen mounts with very little adaptation, but they cost around £300. go diy with a raspberry pi stepper motor HAT using the existing motors, cost circa £20. And being keen to get to grips with stepper motor magic for other reasons as well, I went with option 2. Well some success, but not quite what I expected! 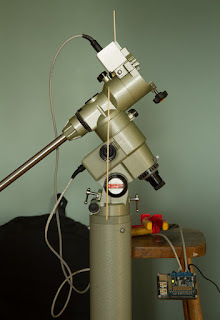 Not going to say much about my scope other than it is using a Vixen GP mount which had an ra drive fitted when I bought it, and I am fitting a dec motor to it. Both motors are vixen MT1 and I have a hand controller DD-1. I'm first of all planning to add an ST4 interface to the controller, which looks pretty simple, and then use a PiFace to drive the interface. I'll then use Linguider to give me an autoguide capability. I'll look at adding goto later. I'm using Raspberry Pi, 'cos I have a couple already doing other things and I like them, plus it's nice low power so I can run on batteries, and lots of people are using them as telescope controllers. The GPIO on the pi means I can drive various things direct, rather than through various adapters, although I will use a PiFace to protect the pi and give me a bit more drive (the built in output pins are only 3.3v and very limited current). I'm using linguider 'cos I've read in many places that it works far better on pi than the other obvious alternative - openphd, plus I relatively easily added support for driving piface outputs to it. This setup all works, although I need to tweak the settings of lin_guider and / or the scope alignment to get a nice tight tracking. lin_guider reports a swing on tracking of around 6 - 8 arc seconds on 1 axis (the other axis is < 1 arc second). 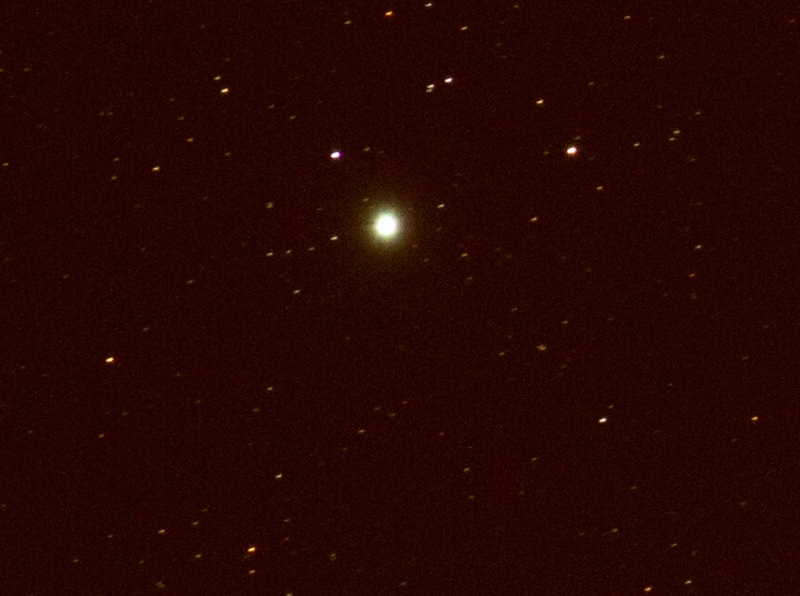 This is a 2 minute exposure with a 560mm lens on a crop frame camera. 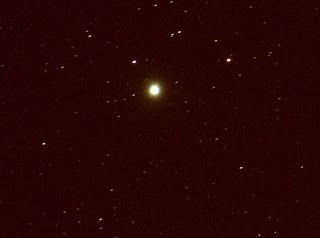 If you open up this piccy (which is a big crop from the original) you will see all the smaller stars are slight stripes. This setup looks like it will work well for tracking, but as I can't change the speed of the motors except by moving the switch on the DD-1, goto is not going to be seamless. 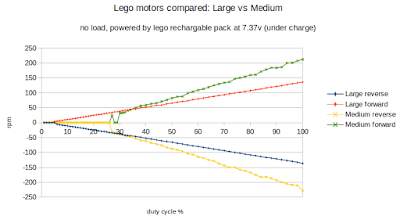 I'm getting ready to write some nice control software for my Lego motors and have done some initial tests to see how they perform. For real use normally one would use rpm regulated mode of course. Unless you need the ultimate rpm, the large motor is a more consistent performer. The motors that come with the Lego Mindstorms EV3 comes with motors with positional feedback and reasonably sophisticated controls. The 'brick' that interfaces with all the widgets can also easily be hacked to enable use of sensible programming languages rather than the visual language (which has some significant limitations) that Lego have developed. The ev3dev update is especially good as it can easily be removed to revert back to the original state (it is installed on an SD card and no changes are made to the controller). So here is a quick blog of what I have done to get up and riunning with python on the EV3. I did fall down a couple of bear pits along the way, so this describes how to get to a working solution.